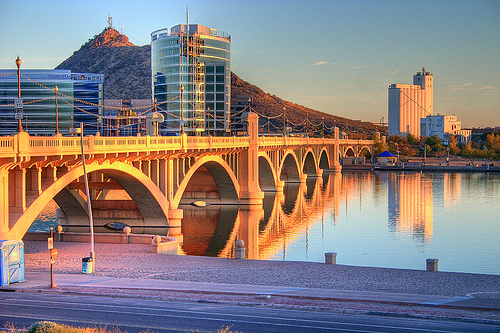 Tempe is a small city of 160,000 people situated just southeast of Phoenix. With lots of great schools, parks, shops, art installations, and events to enjoy, it’s a fun place to be all year round. This middle-class, family-friendly community is a popular spot for young adults, who have flocked to the area for its many great employers. There’s plenty to see here, and you’ll love the spectacular sight of the Salt River against the backdrop of the mountainous terrain. Come discover the fun life you and your family can have in Tempe. Tempe is home to lots of great public and private schools in multiple districts. The local Arredondo Elementary School is a B-grade school that has been rapidly improving the rigor and quality of its programs since the induction of its new principal, a former curriculum director. The school offers a strong gifted program for children who demonstrate superior intellect, as well as a two federally funded Native American education programs. The local Tempe High School has a variety of great courses and programs for students. The offers IB studies for subjects like math, chemistry, fine arts, Spanish, and a philosophy course called Theory of Knowledge. Tempe High School also offers all sorts of fun clubs for students to join, including the DECA business and marketing club, a chess club, a Gay-Straight Alliance, a robotics club, and the Thespian Society theatre arts group. Tempe is home to a wide array of great shops that locals love. The nearby Rustic Hutch on East Baseline Road is a great place to find unique country-inspired gifts and décor, while Best Deal In Town offers reduced prices on home furnishings, electronics, and home theater systems. Looking for a great mall to crawl? The Tempe Marketplace is a fun outdoor mall with over 1 million square feet of retail space. With outdoor water features, fireplaces, light elements, restaurants, and top-notch retailers, it’s not just a place to pick up what you need – it’s a fun weekend experience for the whole family. At this great local mall, you’ll find retailers like Barnes & Noble, Best Buy, JC Penney, Oakley, Target, The Gap, and Sam’s Club. The Tempe area is a great place for getting active and enjoying the natural desert surroundings. The local Tempe Town Lake is a popular spot for sports like boating, rowing, SUP boarding, fishing, cycling, and running. The local Phoenix Rock Gym on East University Drive offers 15,000 square feet of rock climbing surfaces ranging in difficulty from easy “cruising routes” to “overhanging arm blaster” routes. Looking for a great golf course? The local Rolling Hills Golf Course is an 18-hole championship course that also features a full-service restaurant and bar. This par 62 course was originally a 9-hole course, but in 1987, renowned golf architect Gary Panks designed the back nine. The full course runs a total of 3,828 yards. The club regularly hosts great night events like the Two-Person Scramble, where two players go head-to-head in a competition for Best Tee-Off and a play-by-play Best Shot contest. Tempe features a full calendar of year-round events to enjoy. The local Phoenix Zoo hosts semi-annual Prowl & Play nights, with fun themes and great children’s activities. The June 2015 Prowl & Play featured a “Frozen” theme, which involved meet & greets with Anna & Elsa from Disney’s Frozen, a Make Your Own Snowflake craft station, a pin-the-carrot-on-the-snowman contest, and fun ice-related science experiments. Looking for some Christmas fun? The Tempe Fantasy of Lights is an annual light-up celebration that runs from late November to mid December. The Opening Night Parade is the official kick-off to the holiday season, and for the past two decades, this fun family event has delighted residents with as many as 40 different parade floats, clowns, marching bands, and balloons. And of course, no winter parade would be complete without a visit from Santa Claus. Later on, in mid December, Tempe Town Lake plays host to the next Fantasy of Lights event – the Boat Parade. This parade features 50 unique boats adorned in festive lights. Be sure to bring a camera to snap your Santa selfies! Tempe is a vibrant city that has lots to offer the many families who live here. With all sorts of great schools, fun events, and top shops around, it’s not hard to see what has made Tempe one of Arizona’s fastest growing cities. Are you ready to view homes in Tempe? Our buyer-only specialists can help you find the perfect Tempe home for your family. Call us today to talk to a real estate agent about finding your new piece of Tempe real estate.